Well here we are in a new year, 2016 is upon us and I hope it brings peace and happiness to all subscribers and followers of the Andy Beck Images website. 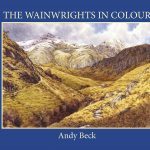 The year for me looks as if it will be really important as I soon hope to complete the Wainwrights in Colour project and get the accompanying book published. Already I have a large list of people requesting copies but as I am self publishing it will be a nervous time as I hopefully sell a good volume of the one off print run as soon as possible. Once that project is done and dusted I will then proceed to work on other projects which are already lined up. This not only includes the possibility of another smaller book but also importantly to get my websites fully up and running. I have some exciting plans for these sites which will feature not only my paintings and photographs but also all of my walking routes completed over the past year or two, presented in a totally unique way, so watch this space. Despite the fact that my attention has been focused on the Wainwrights project I have been humbled by the amount of attention my photography receives, not only on social media but also thanks to having some of my work featured during 2015 on the BBC and in national magazines and publications. This has lead to many requests for copies of some of my images as prints by customers which really is pleasing as at this time the website is not set up for retailing of my photographs. Over the Christmas period I was able to put together a short couple of videos with a selection of my photographs taken in 2015 from both Teesdale and The lake District. Here they are for you to enjoy. Many thanks for all your support in 2015 and I hope that I will be able to provide some interesting features for you to enjoy in this brand new year.